Raised by his protective mother in the sunny clime of the south, Gavril Andar knows nothing of his father—or the ominous legacy that awaits him. But his innocence is about to be shattered. The man who ruled the wintry kingdom of Azhkendir, a man infused with the burning blood of the dragon-warrior known as Drakhaoul, has been murdered by his enemies. It is his fiery, chameleonlike blood that pulses through Gavril’s veins. The news is Gavril’s first taste of death—but it will not be his last. For blood is the liquid that seals his fate. Expected by clan warriors from the north to avenge his father’s murder—and still his unquiet ghost—Gavril is kidnapped. He soon learns that becoming Drakhaon means not only ascending to the throne of Azhkendir but changing, in subtle ways at first, into a being of extraordinary power and might. A being that must be replenished with the blood of innocents in order to survive. 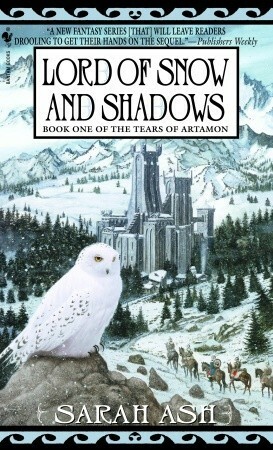 Ensconced in Kastel Drakhaon with no means of escape from the icebound kingdom, and carefully watched by neighboring rulers waiting to move against him, the untested Gavril must fight to retain his human heart and soul in the face of impending war—and the dark instincts that threaten to overpower him. This book is different from the YA fantasy books I’ve read lately. The setting has a Russian feel to it, which is unusual because most other fantasy worlds can’t help but have a western background. The story of Gavril is also a lot more grim, it deals with some heavy stuff and not at all in a childish way. Questions like: “Do I put my own life in front of others?” and “Can I trust someone who’s cursed with something so dangerous it might kill me?” dominate the book. The storylines followed throughout the book are the political intrigue and the dominance of a world different from ours, but still recognizable. The story takes place in a timeframe more than a century ago, with the introduction of the telephone (or here the Vox Aethyria) and the World Wars, although there aren’t any more indications to the right period in ‘history’. A book in which court intrigues play a major role are a personal favorite of mine, so Lord of Snow and Shadows is right up my alley. The author made good use of the opportunities that this book presented and everything was nicely written and explained so that it wasn’t very difficult to follow. The name of the series: The Tears of Artamon is very briefly introduced in this first book, but what their role will be in the further story remains a bit of a mystery. The use of magic is more subtle than I’m used to: the drakhaoul demon, the magus and the guslyars all possess some kind of magic, but the majority of the population has no magic and has rarely heard of or seen it. Ghosts coming back from the “world beyond” and unexplained phenomena can aslo be attributed to magic, but these all derive from the particular powers of one or more of the magical people mentioned above. In terms of writing style, I have some comments: sometimes there’s just too much happening in a too limited amount of phrases, the events seem rushed and confusing. The transitions between the POVs is here and there rather abrupt, but otherwise the book reads very smoothly. Many stumble over the exotic names, but they are one of the more original things I’ve read in a while. Only the name "KiuKiu" isn’t really my thing, but that's just a personal preference. The author obviously has a talent for creating well defined and loveable characters. Some might even surprise you in the end by their actions or feelings. Nothing is exactly as it seems. Elysia, the mother, who seems to be a strong woman in the beginning turns out to be incredibly naïve and very easy to manipulate. She's one of those characters you just want to scream at: "No! Don't trust that guy, can’t you see he's just going to double-cross you?! Run as fast as you can! "But off course, they will not listen and you see them walking into a trap with their eyes wide open. And then you just sigh and sit there with an "I-told-you-so" look on your face. I really enjoyed this rather unknown book, and I would definitely recommend it to the more seasoned fantasy readers.